How regularly do school children eat in Southern Africa? In response to this, and partially as an initiative to alleviate child hunger, many low income countries have implemented school feeding programs, including Botswana and South Africa. Figure 26 below shows the proportion of Grade 6 students that reported receiving at least one free school meal per day. Botswana has the highest proportion (91%), followed by South Africa (78%), Namibia (25.64%), and Mozambique (12.64%). The success of Botswana’s school feeding program is widely acknowledged, and has also been credited with improving school attendance rates in the country (Zuze, 2010, p. 3). 1) There is a high proportion Mozambican and Namibian students who do not eat breakfast regularly, if at all. Indeed, 30% of Grade 6 children in Mozambique and Namibia reported that they only at breakfast once or twice a week, or not at all, compared to 19% in South Africa and 18% in Botswana. This can have a detrimental effect on learning. As Del Rosso (1999, p. 5) notes: “Even temporary hunger, common in children who are not fed before going to school, can have an adverse effect on learning. Children who are hungry have more difficulty concentrating and performing complex tasks, even if otherwise well nourished”. 2) 14% of Namibian children reported that they only at lunch once or twice a week, or not at all, compared to 11% for South Africa, 8% for Mozambique, and 7% for Botswana. 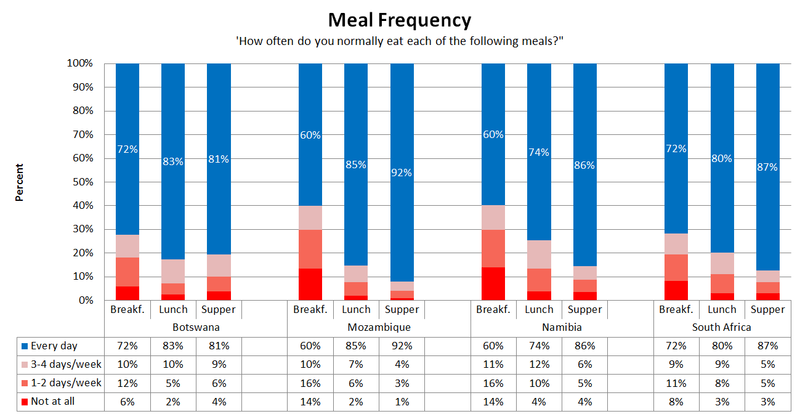 3) There is a surprisingly low proportion of Batswana students who reported having supper every day (81%), compared to Namibia (86%), South Africa (87%), and Mozambique (92%). It is perhaps counter-intuitive that Mozambique should have the highest proportion of students receiving lunch and supper ‘every day’. However, this may be because many Mozambican children do not receive a morning meal and thus their parents are more likely to give them mid-day and evening meals. If this were the case, one might expect Namibia to show a similar trend since it also has a low proportion of students receiving breakfast ‘every day’, yet it does not seem to exhibit such a trend. Although meal frequency is an important indicator of nutritional intake, it provides no indication of nutritional content. Within our four country sample, it is not unreasonable to assume that there is a positive relationship between nutritional-content of the average meal and GDP per capita. For example, it is more likely that South African children have access to iodized salt and fortified cereals than do their Mozambican counterparts. Therefore, although 92% of Mozambican children report that they receive supper ‘every day’ (compared to 87% of South African children), one should be aware that these meals most probably have differing nutritional content.